Vessel Type: Water Jet Fast Attack Craft. INS Car Nicobar T69 (Yard 2057); Laid Down - 27 Jan 2007, Launch - 23 November 2007, Commissioning - 16 Feb 2009. INS Chetlat T70 (Yard 2058); Laid Down - 27 Jan 2007, Launch - 27 November 2007, Commissioning - 16 Feb 2009. INS Cora Divh (ex Cinque) T71 (Yard 2059); Laid Down - 29 Aug 2007, Launch - 16 July 2008, Commissioning - 10 Sep 2009. Kabra T76 (Yard 2064); Keel Laying - March 2009, Launching - 29 March 2010, Commissioning - 08 June 2011. Karuva T78 (Yard 2066); Keel Laying - March 2009, Launching - 29 March2010, Commissioning - October- December 2010 --->July/Aug 2011? Displacement: 288 tons/ 325 tons full load. ................Moulded Depth - 4 metres. Main Machinery: Triple Hamilton HM811 water jet units coupled with three MTU 16V 4000 M90 engines, capable of producing 8,160 kw (11,238 hp) of power. Maximum Range: 2000 nautical miles at 12 - 14 knots. Complement: Four officers, 35 sailors. Weapons: One CRN-91 (naval version of the 2A42 30mm Medak gun), which is controlled by an electro-optic fire control system developed & jointly produced by the Ordnance Factory Board (OFB) and Bharat Electronics Limited (BEL). Heavy Machine Guns, Light Machine guns, Igla SAM. 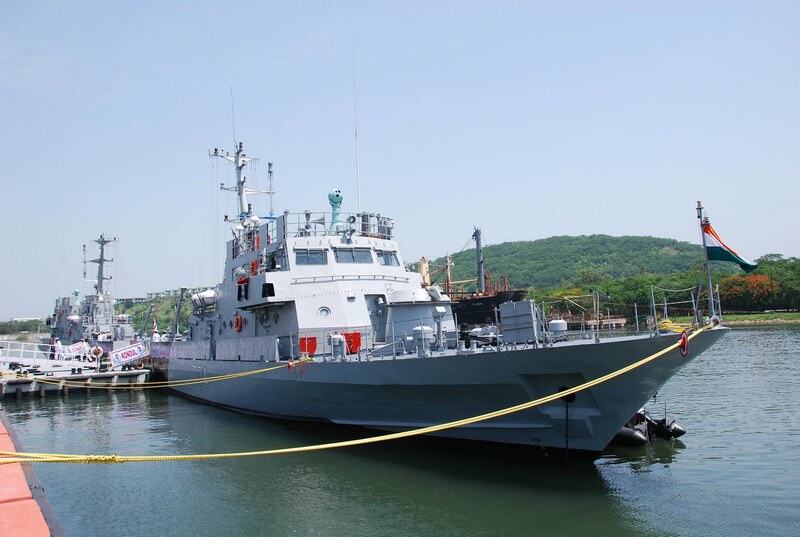 Comments: These vessels are an improved version of the Fast Attack Craft (FAC) earlier constructed by GRSE (Garden Reach Shipbuilders & Engineers) with a more efficient hull-form design and has been proven after extensive model testing to achieve speed in excess of 35 knots. These ships will stay close to the coastline and be used mainly for patrolling and rescue operations. Rear Admiral T S Ganeshan (Retd) - the Chairman & Managing Director of GRSE - stated, "The ships have submarine warfare capability and are not vulnerable themselves." This would indicate a sonar fit and anti-submarine warfare weaponry, such as torpedoes and anti-submarine rockets. The first vessel - Car Nicobar - has been named after the northernmost of the Nicobar Islands. 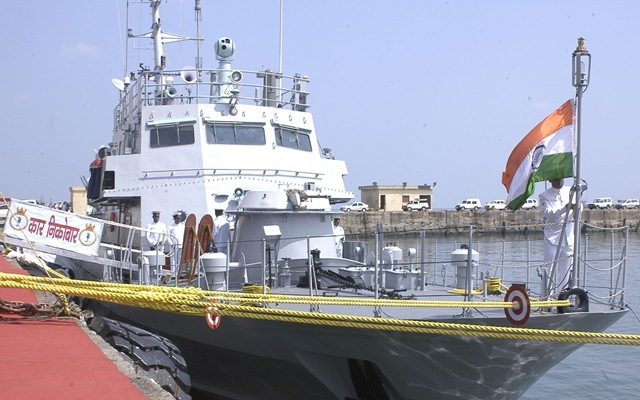 The second vessel - Chetlat - has been named after the northernmost of the Lakshwadeep Islands and was launched by Mrs Beena Suthan, the wife of Vice Admiral Raman Prem Suthan - the Flag Officer Commanding-in-Chief of the Eastern Naval Command. These are the first warships to be built at the built at the Rajabagan Dockyards purchased by GRSE in July 2006. In a unique event, on 16 Feb 09, the Indian Navy will commission two ships, INS Carnicobar & INS Chetlat on the same day. These would be the first two in a series of ten Water Jet fast attack ships being built at Garden Reach Shipbuilders and Engineers, Kolkata. The ships are being commissioned at Chennai by the Hon’ble Governor of Tamil Nadu, Shri Surjit Singh Barnala and are the first ever water jet propelled ships of the Indian Navy. The commissioning marks another step in the direction of indigenisation of the Navy’s ship building efforts. 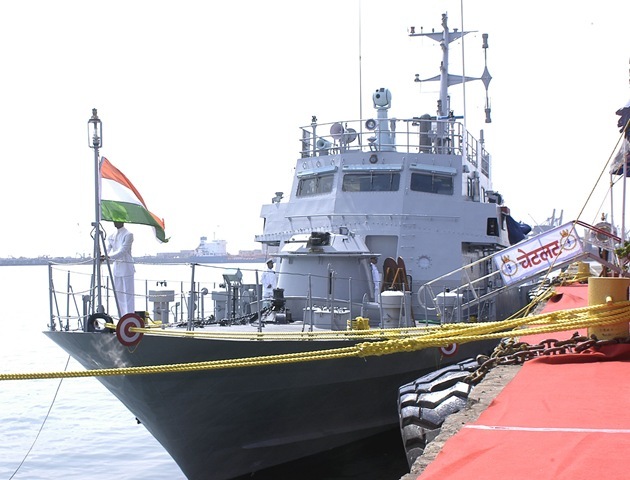 These fast attack crafts are named after pristine islands located in the Andaman & Nicobar and Lakshadweep respectively and will be based at Chennai thereby strengthening coastal security of the region. These fast attack crafts are most suited for interception of fast moving surface crafts apart from performing anti smuggling, fisheries protection, as well as search and rescue operations where time is of paramount importance. These are the two ships of a new generation of ten Water Jet Fast Attack Crafts, designed and built by Garden Reach Shipbuilders and Engineers, Kolkata. They are an improvement upon the earlier version of the Fast Attack Crafts, with a more efficient hull form developed indigenously. The Fast Attack Crafts can achieve speeds in excess of 35 knots. The Hamilton HM 811 waterjets of these ships are coupled with latest generation MTU 16V 4000 M90 engines with a combined propulsion power of 8160KW. The modified Aluminium superstructure of the vessels, reduces their Radar Cross Sections (RCS) and also provides improved habitability. A Reverse Osmosis (RO) Plants allow for fresh water generation increasing vessel endurance while the Sewage Treatment Plant (STP) complies with the latest International Maritime Organisation (IMO) regulations on sea pollution. The armament includes the 30mm CRN-91 Gun along with sensors manufactured by Ordnance Factory, Medak. The ships are equipped with IGLA missiles, SLRs, HMGs and LMG/MMG in their armament fit. These features are an up-dation over ships of the previous class and the current version of design is comparable with similar ships, built across the world. The first pair are restricted to speeds of 27 knots because of problems with their gearboxes. Delivery of the 2nd pair has been delayed because gearbox problems need to be rectified by the vendor, KPCL. on Sep10, 2009 West Bengal Governor Gopalkrishna Gandhi commissioned INS Cora Divh and INS Cheriyam at GRSE. INS Cheriyam and INS Cora Divh, are commanded by Commander Sudip Malik, and Commander N Hariharan respectively both specialists in Gunnery and Missiles. INS Cankarso and INS Kondul were commissioned at Vishakapatnam on Tuesday, 29June 2010. Both ships will be based in Goa and tasked with the role of detecting, locating and destroying small, fast-moving enemy surface craft engaged in covert operations. INS Cankarso is commanded by Lt Cdr Arun Bahuguna and INS Kondul by Lt Cdr Shashidhar R. Patil. The two ships have 45 sailors and four officers on board. INS Kalpeni was commissioned into the Indian Navy on Thursday, October 1, 2010 by Hon’ble Mr Justice Jasti Chelameswar, Chief Justice, High Court of Kerala at Naval Base Kochi. INS Kalpeni would operate under the Flag Officer Commanding in Chief Southern Naval Command and based at Kochi. The Ship commanded by Lieutenant Commander Subhal Nathan has a crew of 3 officers and 38 sailors onboard. INS Kabra was commissioned on Wednesday, June 8, 2011 by Vice Admiral KN Sushil, FOC-in-C, Southern Naval Command at Naval base Kochi. The ship, with a crew of 3 officers and 39 sailors is commanded by Commander Bandhul . Kabra, Koswari and Karuva have ZF gearboxes in place of KPCL units as well as additional modifications based on feedback from the Navy. GRSE delivered Yard 2065 on 27 May 2011 and expects ot deliver Yard 2066 by end June.